December 12, 2018 at 3:31 pm. 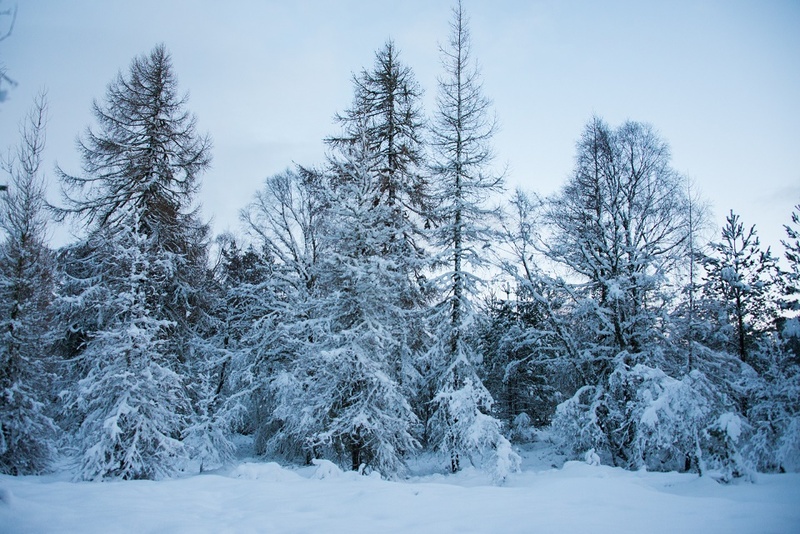 All the above and more is either still happening throughout winter or to look forward to in your 2019 Christmas holiday in the Highlands. For three days from 14th-16th December this already beautiful park is transformed into a Wonderland. Filled to the brim with shimmering illuminations, the event is based around a number of giant attractions installed by The Highland Council’s Lighting Team. Another main attraction is of course Santa, who will arrive in style with his devoted reindeer for a spot of relaxation before all the hard work begins. This event has always been popular with young families and a favourite for toddlers. All you have to do is wrap up warm, believe in magic and watch Whin Park come to life before your very eyes. This is ideally located when you rent an entire castle on the shores of Loch Ness, which provides a sumptuous home from home to return to after a night of festivities. This official Hogmanay party in the heart of the city has had its line-up of bands and artists confirmed since the end of summer. The people of Inverness are almost bursting with anticipation of this festive celebratory event. Expect upbeat tunes, original songs and traditional Scottish favourites. The Trad Project, Blazin Fiddles and Tide Lines have been given the prestige of bringing in the New Year. Crowds will gather to watch a great fireworks display over Inverness Cathedral to signal the start of 2019. This event promises to be a night to remember in a unique venue. It’s a wonderful celebration of Hogmanay combining all the elements of this magical season with food, music and also laughter at its heart. And finally, anyone who chooses to rent an entire castle and holiday in Loch Ness during Christmas and New Year will have the chance to spot Nessie in a Santa hat! Well, maybe this one’s a long shot, but here in the Highlands we have nothing if we have not faith. In addition to all of the above there are other ongoing celebrations to commemorate the Christmas culture. These includes festive drams, visits to Santa, Christmas pantomimes, food markets and fairs. June 20, 2018 at 9:31 pm. As summer begins it’s time to start thinking of entertaining al fresco. Whether your garden space is small and intimate or large and lavish, these top tips make the ideal guide to hosting the perfect summer garden party. Or you could hire an entire castle; Aldourie Castle loves to throw a good outdoor party and we’ve highlighted some personal Castle choices throughout. When it comes to deciding on your garden party guests list it’s important to think about what will create a relaxed and enjoyable atmosphere. At Aldourie we specialise in hosting the ideal house party of up to 30 guests, and as you hire an entire castle you take exclusive use of the Castle and grounds. Social gatherings such as birthday celebrations, anniversary dinners or reunions are mainly made up of close family and friends. Therefore, we suggest this mix of guests as the ideal for your perfect summer garden party. Invite too many guests and you lose the intimate atmosphere. Likewise, invite distant relatives or friends of friends and you risk your party lacking familiarity and easy conversation. The process of choosing a theme for your perfect summer garden party can be fun. Involve the children in sharing ideas too so they feel they’re involved in the party from the start. Having a well-chosen theme gives focus to the social gathering and makes it easier to plan the rest of the party set up. Ideas you could consider are nautical/beach, contemporary, Nordic or vintage. Aldourie Castle Estate’s chosen theme: this would have to be the Scottish Highlands; scattering tartan blankets and cushions and offering a well-crafted whisky cocktail. You can host a winning summer garden party that will indulge your guests and be the talking point at social gatherings for months to come. How can you do this? 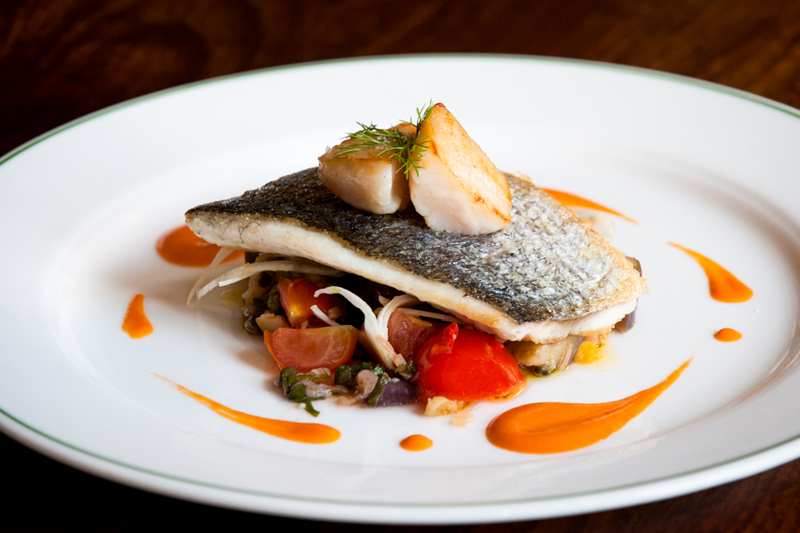 By serving delicious, well-thought out food and drink throughout the day and into the evening. If you plan ahead with your food and drink choices you can create the perfect al fresco dining experience. The key is to opt for dishes that complement the season, using fresh ingredients and local produce. On hot days be sure to have jugs brimming with ice cold juices, Pimms and cocktails. On warm days keep the wine flowing and have a welcome drink ready for all – champagne, anyone? If there are families on the guest list then remember to feature some fun, child-friendly food and drinks too. Aldourie’s dishes: a Loch Ness inspired fish course (possibly salmon to cater for the majority of guests) and Scotland’s own colourful, summery cranachan for dessert. Delicious! Nothing helps to create the perfect summer garden party more than a beautiful display of fresh flowers. If you’re lucky enough to have a colourful garden complete with all the blooms of the season then why not pick some for your table centerpiece? Depending on your choice of party theme opt for either formal or wild flowers. 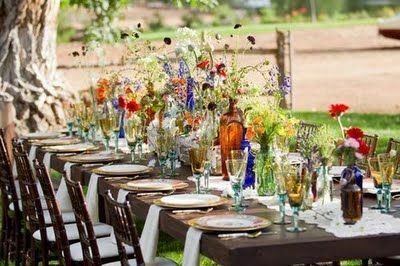 The scent of the florals will also add to the guest experience of your perfect garden party so remember this when choosing what to place where; evoking people’s senses when they least expect it adds a touch of magic to your showcase. Aldourie’s flower choice: a selection of blooms freshly picked that morning from our wild flower garden. This would be a perfect tribute to the wild Scottish Highlands landscape that surrounds the 500 acre Estate. Keep your eyes peeled for our second installment of our 10 top tips to the perfect summer garden party. Why not book Aldourie if you’re looking to hold a milestone birthday in a castle or enjoy a family reunion castle stay. 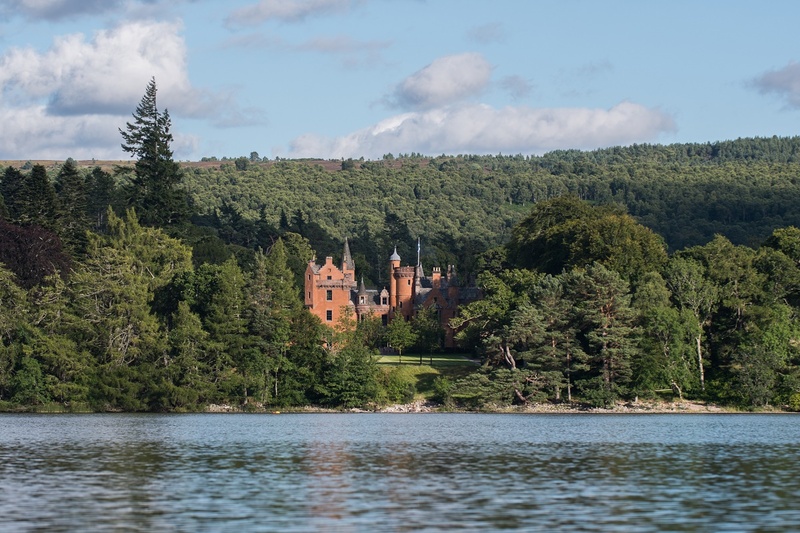 We specialise in exclusive family holidays on Loch Ness in this private use Castle and whilst you’re here why not let us host your perfect castle garden party over summer. Email info@aldouriecastle.co.uk or visit our castle hospitality webpages for more information. READ PART 2 of our SUMMER GARDEN PARTY blog post here for more outdoor party inspiration when you hire an entire castle. April 6, 2018 at 5:41 pm. The nights are lighter for longer. The days are warmer. We’re feeling more optimistic by the day. It’s the start of spring. And what better way to celebrate than by tasting the delights of the season during your castle stay in Scotland? One of the most favoured desserts is an old-fashioned pudding known as cranachan. It combines freshness and creaminess with whisky comfort and is very light making it so easy to devour. Aldourie’s chef loves the Castle and grounds during spring. The colours on the Scottish Highlands’ Estate change from golds, coppers, oranges and reds to crisp greens and bright yellows almost overnight. The lift in the weather makes everything appear clearer too. And the appetites of our exclusive use guests change also. Gone are the preferences for succulent meats, rich sauces, toe-warming soups and puddings. Our guests are now craving fresher, lighter and more colourful desserts. Because Aldourie Estate now features its own kitchen garden our exclusive use house parties are keen to sample some of the fruit grown within those stone walls. And Chef is only too happy to oblige creating some old and new berry-based puddings. 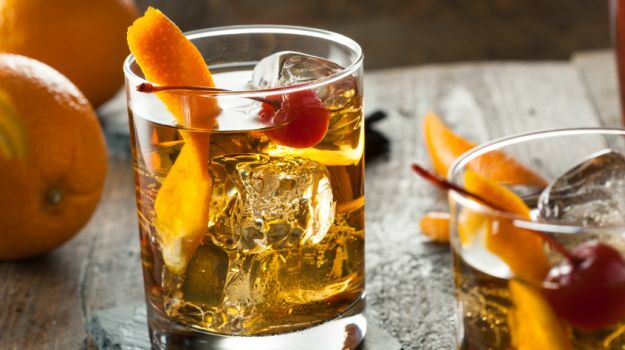 Below is a recipe loved for its creamy texture, sweetness and fruity tang as well as the unmistakeable Scottish ingredient: whisky. Cranachan is a traditional Scottish dessert and a delicious alternative to trifle. It is both pleasingly colourful and cooling on a warm spring day. During the months of April, May and June, private house parties at Aldourie request this dessert time and time again. The Castle’s private chef would like to share one of his favourite and most popular spring puddings with you to make at home during the warmer and lighter months ahead. Toast the oats in a frying pan (be careful not to burn them). Lightly whip the cream until it creates soft peaks. Fold in the whisky, honey, oatmeal and raspberries. Serve in dessert glasses with a scoop of berry sorbet and garnished with a few raspberries. Where is best to enjoy cranachan in Aldourie Castle? Exclusive use Castle stay house parties dine in various rooms in the Castle depending on the time of day. 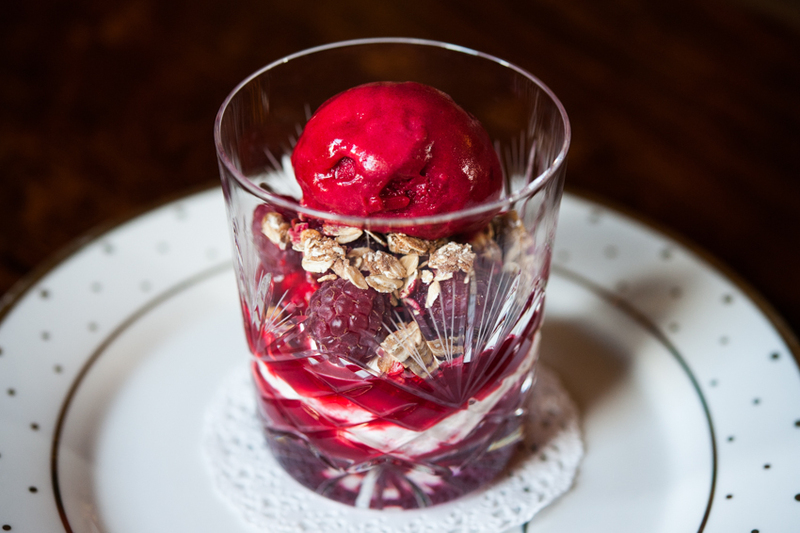 A mid-morning treat of cranachan would be best enjoyed from the cosy yet light Lairds Room. On a sunny spring day cranachan after a salad lunch is best tasted outside in the Castle garden admiring views onto Loch Ness. The imposing Main Hall would be the chosen space to eat cranachan as part of a Scottish feast. Here exclusive use house parties frequently gather around the large long oak table for celebration supper in true clan-like fashion. Last but not least, the beautiful Dining Room is the ideal for dining alongside family and friends. Come dinner time at the Castle we light the candles as the conversation and wine start to flow. Stunning parkland views will accompany your cranachan; your fourth delicious course cooked by Aldourie Castle’s personal chef. Look out for more recipes from Aldourie Castle by signing up to our newsletter through our blog web page. In the meantime, enjoy a glass of fresh, sweet and cooling cranachan in the comfort of your own home this spring. And don’t forget to post us a photo on Aldourie’s Facebook or Twitter page saying which room you enjoyed eating it in. February 10, 2018 at 1:15 pm. The Black Isle is a peninsula in the Scottish Highlands, just north of Inverness. 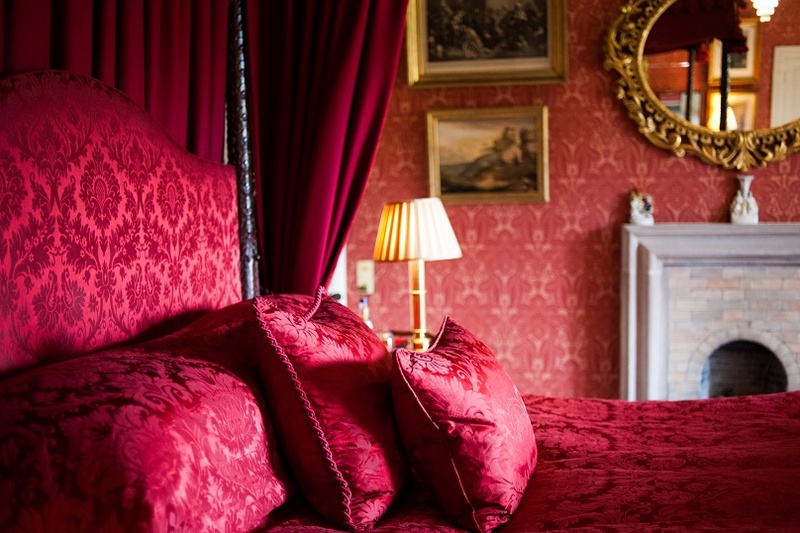 It’s a wonderful place to explore with family, friends or a loved one when you stay in an exclusive use Scottish castle on Aldourie Castle Estate. 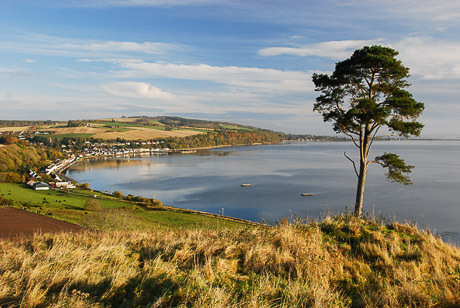 The Black Isle is surrounded by water on three sides. To the north is the Cromarty Firth, to the south the Beauly Firth and the Moray Firth marks its east. The Isle also has rivers to its west; water, water, everywhere. You can imagine the views to be had during a day of walking there. This famous spot in the magnificent Highlands is home to nature and history in equal measure. So, there is lots more to see besides the stunning views that come with its many walks. The Black Isle is well known for its rich farmland and showcases neatly ploughed, lush green fields over-spilling with crops. This itself is enough to draw large numbers of tourists annually to the Black Isle Show, the largest agricultural show in the north. Aside from farm animals, the Black Isle is home to a variety of Scottish wildlife. During your stay in an exclusive use Scottish castle on Loch Ness, you may think Aldourie Estate is brimming with nature. But just wait till you get here! Watch the dolphins swimming and playing in the water or catch a glimpse of a deer or two wandering through shrubbery on land. The water is also home to otters and seals whilst some days the sky can be filled with soaring osprey. The green landscapes are reinforced by the sprays of endless trees. Amongst the flora and fauna look for the towering Scots Pine, just one of three conifers native to the UK. Through all this woodland you can see Ben Nevis on a clear day. 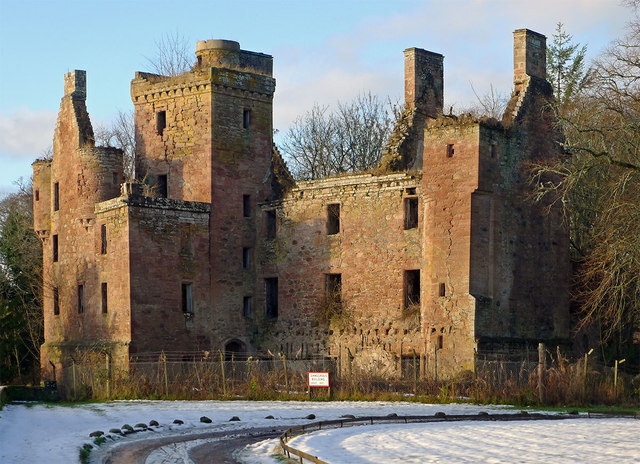 The Black Isle is also steeped in history with its fair share of castles, cairns, a cathedral and a host of museums. There are few holiday destinations that can offer such a large number of historical sites amongst such natural beauty. The Scottish Highlands always comes up trumps for this. The self-contained peninsula is home to numerous historical plots from different eras from Medieval to Georgian. Kirkmichael Church has long been neglected and left to ruin but recently it has reopened to visitors, complete with a lovely cemetery to wander around. Guided tours will inform you of its local and associated families’ history. Redcastle was, until recently, one of the oldest inhabited houses in Scotland, with evidential links to William the Lion in 1179. This ruins creates a haunting skyline silhouette worth gazing at and gives some perspective to your exclusive use stay in Scotland in a luxury private Castle. Cromarty Courthouse, on the Isle’s museums, houses an excellent detailed exhibition including an audio tour for keen tourists. Just like the vast culture of the Black Isle there is a walk for everyone on this charming Highlands peninsula. This is in terms of both the length and the topography of walk. From short circular woodland ambles to long distance coastal trails, you can find something to suit you or your group. Take a look at the walking map and guide page of the Black Isle website which includes a detailed map ideal for planning your walking routes. A favoured walk by those who stay in an exclusive use Scottish castle is the 147-mile John O’Groats Trail. It conveniently starts at Inverness, home to Aldourie Castle, and ends at the pretty civil parish of Alness. This stunning but serious coastal walk is set in two stages and features a mix of shorelines, cliff tops and back lanes as well as the hallmark highland footpaths. During their stay in an exclusive use Scottish castle, many previous guests of Aldourie have enjoyed rambling through the country lanes of Rosemarkie. This is an enchanting village at the bottom of the aptly named Fairy Glen. 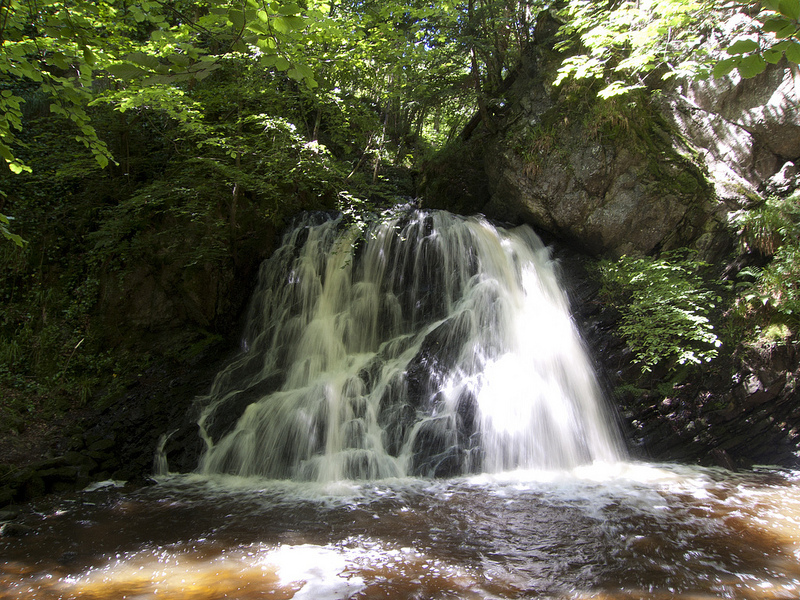 Stop for a romantic picnic at the falls partway through the delightful wooded glen. Learn about its quaint intimate history as you stop at the spring then leisurely stroll past the pockets of floral parades. McFarquhar’s Bed and Cave is a ‘there and back’ style walk combining coastal highlights and geology, with some climbing both ways. Groups of friends who stay in an exclusive use Scottish castle at Aldourie Castle often enjoyed this walk over. This is because it captures a bit of everything but is great for the non-rambler who appreciates scenery. Expect to see seals and dolphins around the Moray Firth and historic gems in Cromarty village. Here is just a selection of places worth a visit, each with their own distinct heritage. Fortrose is the largest town laying on the southern coast of the Black Isle. Architectural loves will appreciate its ornate Victorian buildings amongst its older history – Fortrose Cathedral was built in 1250 A.D. Follow the narrow twisting roads to its bonny harbour and secluded beach for quality time in a true Scottish Highlands town. 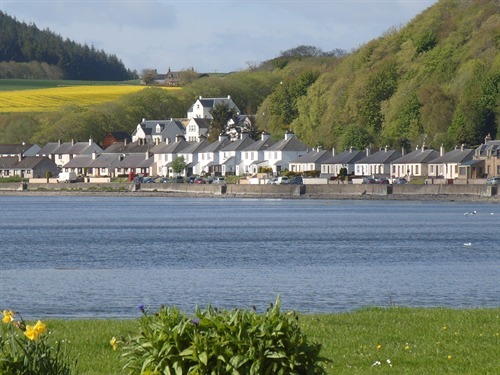 Avoch is a traditional and tranquil fishing village on the east coast with a long heritage. Fishing for herring and sprats in the Inverness and Beauly Firth provided much of the local living for the village which was to last over 100 years. Finally, admire the old town, passing the fisherman’s dock and up Henrietta Street to see the row of low white-walled fisher cottages. 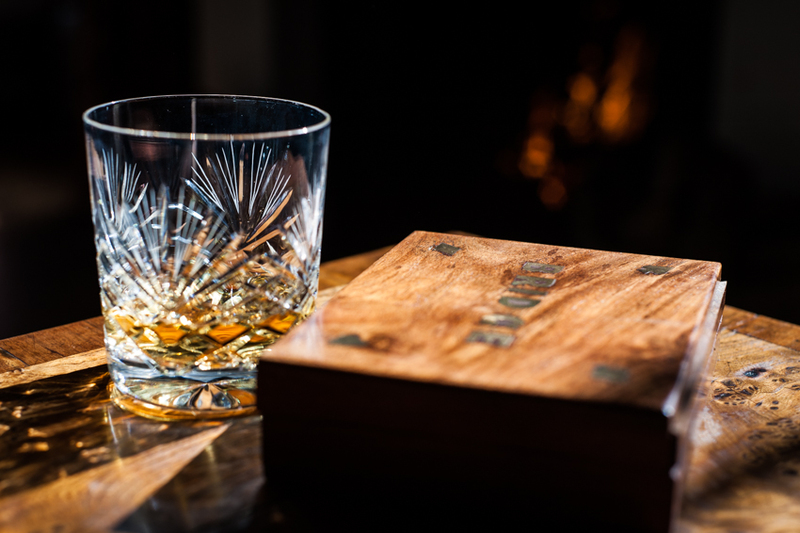 A day out in the Highlands during your exclusive use stay in Scotland is not complete without a little whisky on the side. Muir of Ord, home to the Glen Ord Distillery, features a thriving and dynamic community. The historical village boasts three churches and is a pleasant place to stop for lunch and a spot of shopping. Look out for our blog post coming soon on the varied towns and villages of the Black Isle, which delve much deeper into those mentioned above. The beauty of the Black Isle is yet another gem that the great Scottish Highlands has to offer both its locals and tourists. Exclusive use stays in Scotland become even more spectacular and exciting with wonderful places like this to visit. 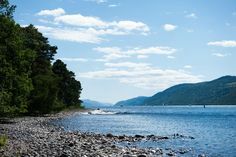 Make the very most of your luxury holiday on the shores of fabled Loch Ness by getting out and about off the Aldourie Estate for a day or two to explore the famous Black Isle and its much loved countryside, coast and villages. January 26, 2018 at 3:06 pm. What’s been happening on the Estate recently? The gardens have endured a rather cold winter and are currently either covered in snow or frozen at the moment. The consistent cold temperatures mean that it’s tricky to get really into the soil. However, our dedicated team of gardeners love a challenge so Aldourie’s Castle grounds and gardens are back to thriving as never before. 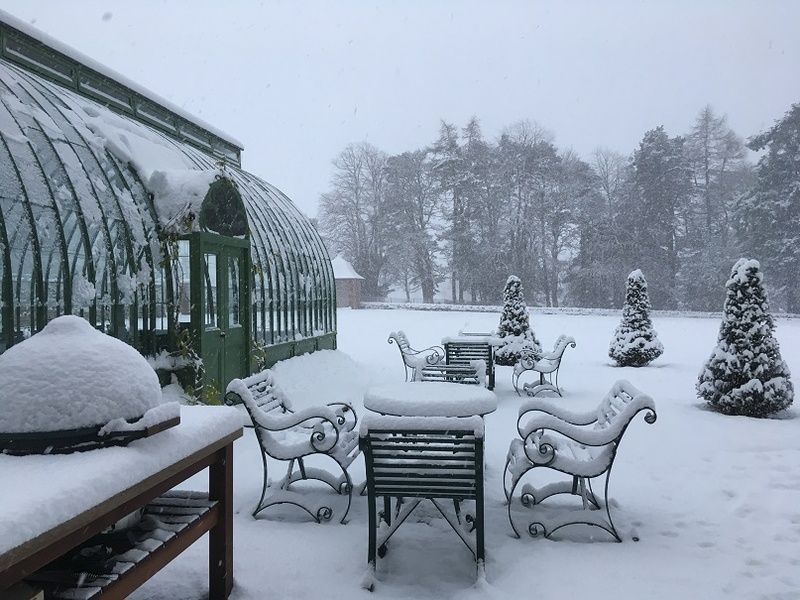 Here you can see some stunning images taken by our head gardener, Duncan, during a magical snowfall on the Highlands’ Estate. The glasshouses have a surreal feel about them when coated in snow and it gives guests such pleasure to walk amongst them. The Castle team are looking forward to spring and summer when the newly refurbished architecture can really come into its own. It’ll then be warm enough to enjoy sitting, drinking and dining in the buildings whilst watching the world go by in the walled garden. 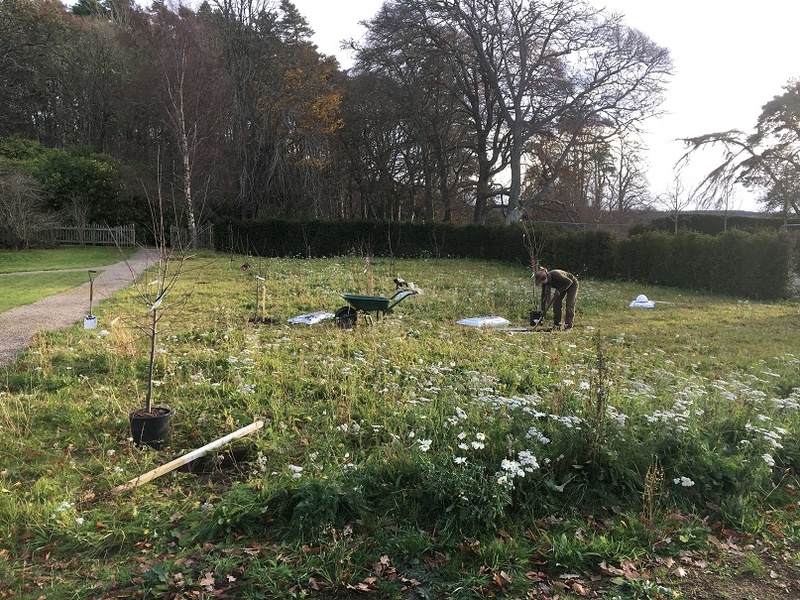 Here you see one of our lovely team members, Fe, planting a fruit tree in the Castle’s new orchard at Garden Cottage, situated just behind the walled garden. The orchard featured a variety of different plums, a few apples, a medlar, a quince and a damson. The wildflowers you see have since been cut but they will regrow in the spring. The orchard area is attached to the walled garden but forms the new garden for the cottage. A lovely little orchard with wildflowers growing under the trees, this also helps to attract pollinators. As always, Aldourie is striving to cultivate an estate in complete harmony by planting new and tending to the old. Come rain or shine, our gardening team is committed to conserving every inch of the 500 acre Estate. You may recall Aldourie’s ambitious plans for the four main garden areas we developed over 2017. Part of this was to bulk plant across the woodland to increase our plant collection. Well, this work has indeed begun during the cold, wintry months of December and January. We have been planting approximately 400 new rhododendrons in the arboretum. These comprise many varieties to build upon the collection we already have. See this beautiful image of the generous flower the moment they arrived at the Castle; an exciting moment for the passionate gardening team! Plans continue to add to the collection of colourful rhododendrons in the spring. The other exciting news is that we have taken on a new Assistant Head Gardener, Chris Smart, growing Aldourie’s garden team to four. Yes, we really do cover all that ground with this small but talented and capable team. Chris joins Duncan, Sarah and Fe at the right time. He will have time to settle in before the major planting of no fewer than 35,000 plants on the Castle grounds and gardens in spring. Just like the hospitality team, the outdoors team also has to make forward plans. Each of the four spaces on the Estate has a set itinerary. We need this in order to stick to the proposed time frame for the grounds and gardens project as it moves into its second year. “Once new planting begins in early March the team of four will be really busy planting, mulching and watering, etc. so I wanted to make sure we were ready for that,” says Duncan. From now on and over the next few weeks Aldourie’s gardening team are preparing the soil in the new beds. We are also continuing to keep on top of the woodland garden – pruning and digging out all of the unwanted plants that have regrown. Soon, the contractors will be back on site to complete the architectural elements of the walled garden. This includes hanging all of the gates, building and installing the fruit arches and cages and finishing the cold frames. The look of this thriving garden space will change yet again in no time. We look forward to showing you more of the Castle grounds and gardens progress as it comes into fruition. Keep a look out on our social media pages for snapshots of work in the gardens, which we continue to share with all our Aldourie followers. January 7, 2018 at 10:23 am. What are the most popular chosen personal resolutions to inspire your year ahead? And how can you achieve these goals? We have listed last year’s top 10 New Year’s resolutions based on a campaign Twitter ran in 2017. We thought it would be fun to see how these most popular targets could be achieved during one of our exclusive Scottish castle vacations. What better place to inspire motivation to achieve your goals than in a sanctuary combining peace, tradition and beauty. Here’s the list of resolutions and some ideas from Aldourie about just how achievable they could be during a stay in a private luxury holiday destination. To start with, the dieting is down to you alone – you’ll have to steer clear of those rich chocolate desserts! But there is plenty of healthy eating options here to help you on your way. 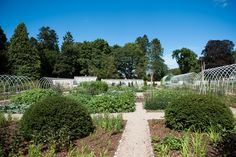 Aldourie’s personal chef can create healthy recipes using fresh ingredients from the walled garden’s herb and fruit varieties. Even during the colder months there are plenty of nutritious treats meals and snacks to enjoy. If you’re wanting to exercise during an exclusive use stay or holiday we can recommend a luxury bootcamp on the lawn for some immediate weight loss. Try some gentle yoga if you’re hoping to get into the mind-set of health and fitness. And, of course, Aldourie has endless outdoor activities for those wanting to add a lot of fun into the mix. Losing yourself in a novel is easy in a private castle, especially with a library fit for the most avid reader. 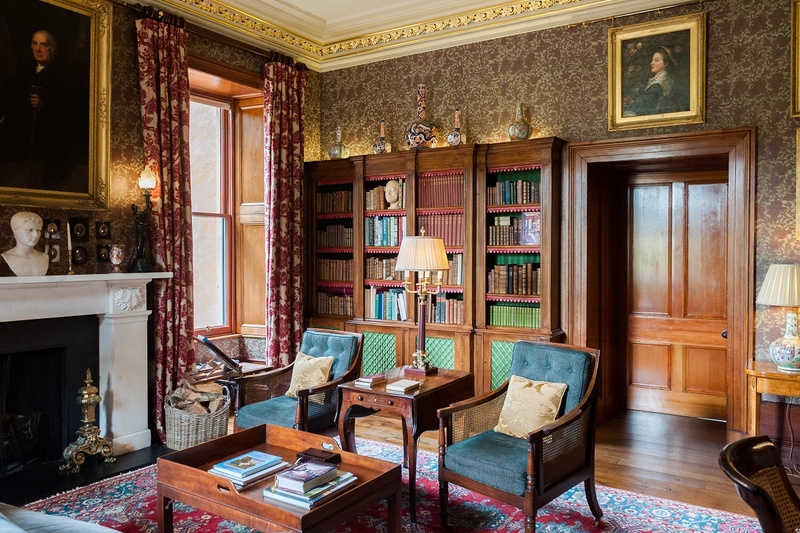 Find a cosy lamp-lit corner, stretch out on a chaise longue or curl up in front of the fire in in the enchanting Aldourie library. 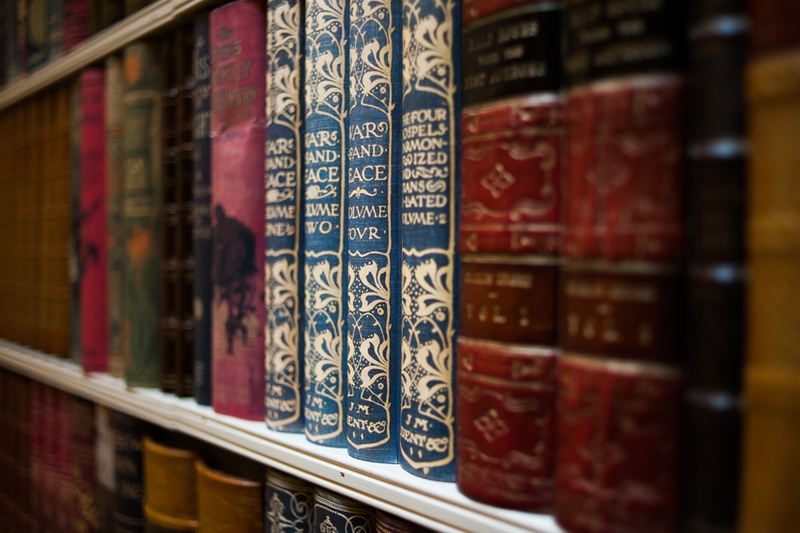 Choose from the bookshelves of every kind of book imaginable and settle down for the afternoon. The beautiful, serene views of the parkland can be your only company, if you so wish. Read more – we told you it was easy during an exclusive use stay in a castle. Again, this can be very simple to achieve, with lots of activities indoor and out to attempt to versify your talents. Try something truly different such as an artisan course or something more popular that you’ve never thought to attempt before. 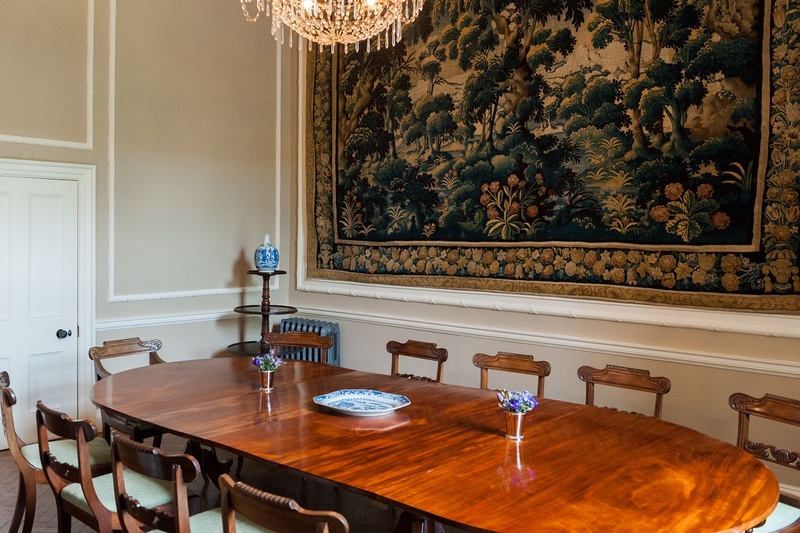 During an exclusive use stay at Aldourie we can arrange artisans to set up in any of the public rooms. Furniture upholstery would be fitting to the history, tradition and arts and crafts style of the Castle, for instance. Or maybe simply sit with a friend on the window seat of your luxury bedroom and begin knitting to your heart’s content. Some of our New Year exclusive use guests may wish to test themselves with something more daring. Book an extreme sport like a skiing weekend in Aviemore (not too far from the Castle) or for something gentler, a canoe ride on Loch Ness. So this isn’t the most practical of New Year’s resolutions to commit to during an exclusive use stay in a private castle. But it helps to look at the bigger picture here. If you (and your family and friends) save money throughout the year you can enjoy the holiday of your dreams the year after. If exclusive use is something you’ve thought was never in your reach, this is a way to make it happen. By the time the year is up, you’ve proven to yourself you can save money and there is a prize at the end of it. Plus, once you’re here with all those you love to spend your time with you may find you don’t need to spend as much – who needs designer shops and fancy meal out when you have everything you need in one exclusive use Highlands Castle? Surely, if you want to improve yourself, this is everybody’s wish deep down. And the good news? During an exclusive use stay in a castle on Loch Ness, you don’t have to try too hard. And the qualities you can achieve in this particular paradise can be extended through the year ahead and the rest of your life, if you’re determined enough. Aldourie Estate features elements conducive to your wellbeing to help spark that longed for change in your personal attributes. There’s ample wildlife, stunning views and beautiful surroundings. Be in the moment more with fresh air, good exercise, scenic walks and a genuine appreciation of Mother Nature. If you’re really stuck, get inspiration from others; spend an afternoon reading a book about someone you admire, consult the ‘top 5 inspirational people 2017’ online or browse your favourite magazines for some how-to articles. Your secret’s safe with us! There’s nothing like an exclusive use holiday in the remote Highlands to spend some time with your thoughts and find your true self. Many guests who’ve stayed at Aldourie have booked the Castle simply for carrying out some soul searching. Here you have time to think about what you really want from life. Away from the daily grind you can view your world and work objectively, make pros and cons list of your qualities and traits and think afresh. This really is an easily achieved goal. Choose a charity and start giving today. ‘But there are so many to help’ we hear you say, so who to dedicate your time and money to? If the answer doesn’t come to you straight away it’s worth thinking carefully about what you feel most passionately about. Aldourie is part of the Wildland Ltd group of properties that is focussed on conservation. If nature and wildlife are things that are close to heart why not think of charities you could support based around this idea? Conservation is a huge global issue covering many aspects and areas. ‘Wilderness is disappearing at an alarming rate’ activists will agree, so if the Scottish Highlands means more to you than a majestic backdrop for your exclusive use stay or celebration, you could embark on not just regular charity-giving or one-off volunteering, but a lifelong venture that becomes entirely more rewarding. OK, so this New Year’s resolution might just be a little extreme for an exclusive use stay in a Scottish castle. Within these walls, it’s hard not to imagine yourself with a traditional tipple in front of a roaring fire or accompanying a delicious four course meal with a glass or two of our finest vintage. If you’re celebrating something special at Aldourie, perhaps a wedding anniversary, it’s only polite to partake with a toast of champagne. You get the picture. In the Scottish Highlands, whisky distilleries, wine tastings and breweries form a large part of a tourist’s itinerary. After all, the Scots know how to drink, right? However, all this aside, remember you’ve chosen to come to Scotland for its rich history, stunning scenery and loyal culture and warm hospitality. Your happiness may just increase simply by staying in the Highlands, so you are more likely to enjoy yourself in other ways. If you can’t start off the New Year with this resolution during an exclusive use stay in a castle on the calming waters of fabled Loch Ness, you’re not trying very hard. Aldourie’s luxury and spacious bedrooms are the epitome of utter indulgence and relaxation; perfect for a good night’s sleep. 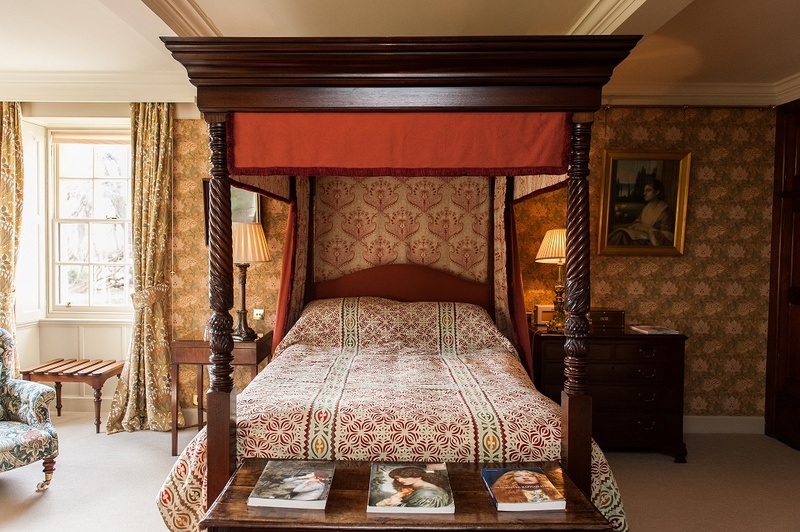 Each of our 13 bedrooms has a grand bed, many which are four-poster, where you can sit and enjoy the window view with a cup of tea or retire for the night. Each room is individually themed and comfort, style and easy living are paramount in their design. Where better to make new friends than in the heart of the Scottish Highlands? Here, almost everyone you meet is friendly and exudes a warmth in tune with this unique, soulful holiday destination. You will naturally find yourself begin a better friend because of the influences surrounding you. Improve existing friendships at Aldourie where exclusive use group stays allow you to share memorable experiences with loved ones. The Scottish Highlands and Loch Ness is a whole other world waiting to be realised by someone new. Don’t sit at home waiting for things to happen to you. Make your New Year’s resolutions and focus on achieving them, if only for yourself. There’s a big wilderness out there designed to make you appreciate life – so, get out there, and enjoy your 2018! December 23, 2017 at 1:55 pm. The moment you enter the large wrought iron gates at the top of the drive you have begun your Aldourie experience. Turn down the winding drive towards the Castle, relishing luscious view across the Estate and Loch Ness. Then, park up and appreciate a friendly and relaxing Scottish welcome at the Castle door. On the first day of your private use castle stay on Loch Ness over Christmas, you may simply want to stand back and take it all in. So, don’t hesitate. The Castle is your own for a weekend or longer. So once our attentive team has shown your exclusive party to their rooms, make yourself at home in your private luxury group accommodation. Each bedroom has individual charm and character, beautiful décor and either a private bathroom or en suite. If your first desire is a glass of champagne and a steaming hot bubble bath, we’ll bring up our finest bottle. Alternatively, if you prefer a guided tour of the Castle artefacts and an introduction to every public room, we can arrange that as well. After a day of luxury and a good night’s sleep you may wish to see the Castle grounds. This is a treat for senses during a private use castle stay over Christmas. The wintry frost-topped trees, crisp woodland floors and festive pine scents will make you believe you’re walking in a winter wonderland. Your starting point is the welly room; grab yourself a pair to fit and head out through the back door. Start with the Castle garden and then up through the arboretum to the walled garden and beyond. There’s so much to delight at Aldourie out of doors with plenty of trails, walks and cycle routes to conquer and explore. 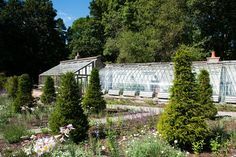 Aldourie Estate has recently undergone some renovations including a revised walled garden and rebuild of the old glasshouses. We now offer a ‘farm to table’ experience for all exclusive use parties of guests. During your exclusive use castle stay take your pick from the fresh produce growing in the walled garden from ripe festive fruits to winter herbs. Then take them to Aldourie’s private chef who will rustle up a festive lunch or snack for your Scottish castle house party. Now that you’ve settled in, make day 3 the day you sit down and truly devour some traditional Scottish food. 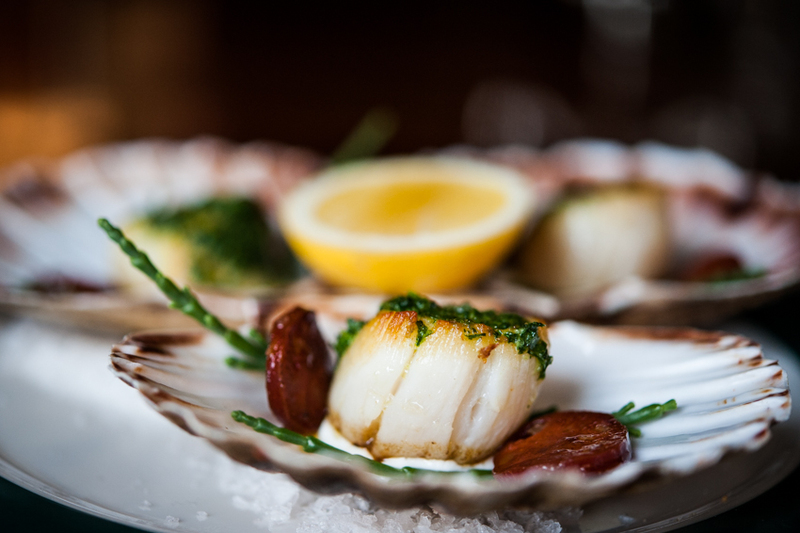 Enjoy a full Scottish breakfast, a delicious lunch and an indulgent four courses at dinner time. Continue your Scotland cuisine experience the following day with a helping of Aldourie’s Afternoon Tea out on the castle garden terrace. Winter berries from the walled garden make delicious cakes to enjoy during your private use castle stay over the Christmas holidays. Wrap up warm in a blanket and gloves and gather your party around you. 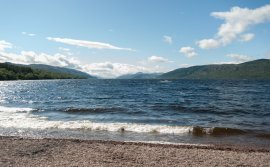 Then sit listening to the gentle Loch Ness tide and smell the fresh Highlands breeze over a warming mug of hot chocolate. Opt for the chaise longues in the Drawing Room if outside is too chilly. The views of the Loch and hills are just a spectacular from there and the fire keeps everyone toasty. Not every animal hibernates during the winter months. 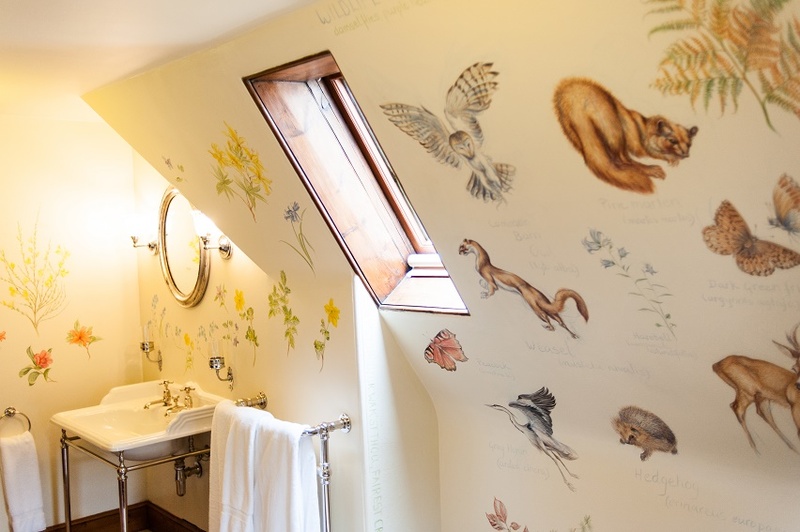 Take inspiration from Wildlife bathroom then go find these gems in your own private 500 acre garden. 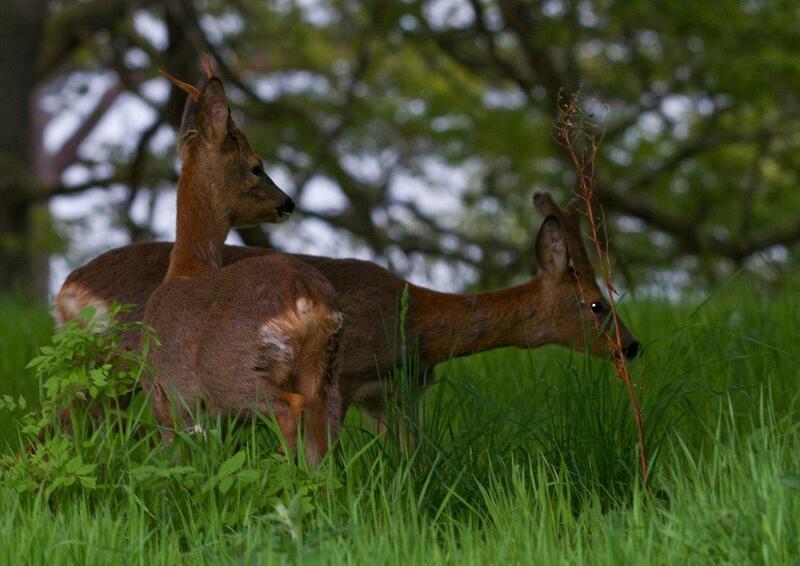 If you’re lucky you may spot roe deer, hares, foxes and red squirrels. Not to mention all the birds: waxwing, robins, snow bunting, osprey and other swooping birds of prey. Stay inside today and check out all the activities and games you can plays indoors during a private use castle stay. Cocoon yourselves in the Billiards Room for a few games looking out of the window over a frosted parkland. Afterwards, why not let the children play some board games whilst the adults go into the library for an afternoon drink and a game of chess or solitaire. Curl up on the sofa in the Drawing Room or take a long bath. 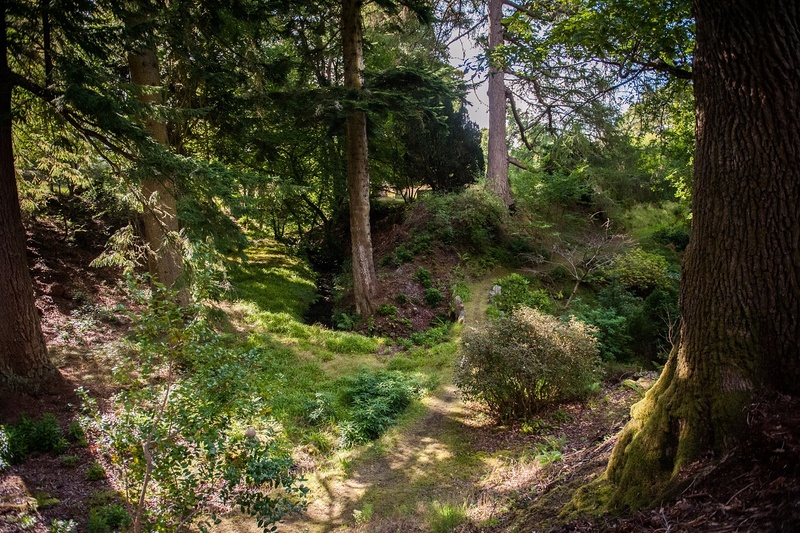 Wander around the gardens or Loch Ness shoreline for time to yourself and inspiration. Think about what it is you’d like to change or work on for 2018 and let the resolutions simply come to you in a happy, peaceful place. It’s New Year’s Eve, so make the most of staying in a Scottish castle such as Aldourie, with its tradition and character. We can lay out a Hogmanay feast for you and your clan in the Main Hall and you can play at first footer at the Castle door. It’s New Year’s Day so what better start to the year than to get out in the great outdoors and let the fresh Scottish air into your lungs and your soul. You’ll feel better for it we promise you – especially if you had a few glasses of sherry too many the night before. The hospitality team can arrange any type of group exercise activity from luxury bootcamps or yoga on the lawn to cycling all around the parkland. If you haven’t already ventured out onto the Loch, then now is the time. You’ve only a few days left and it would be great to say back home that you spent your January out on the most famous loch in the world appreciating the views of the majestic Scottish Highlands. We can arrange boat trips to see historic castle ruins on the shoreline, canoe lessons, zorbing fun for all ages, or a spot of fishing for those wanting to continue the peace and quiet that the initial New Year brings. The Aldourie Estate is full of secret paths, winter trees and spectacular viewpoints, all wonderful to witness during a private use castle stay in Scotland. Find the hidden treehouse in the arboretum or the family graveyard for a spot of Hide and Seek. Family fun and group activities are endless, from falconry, archery and clay pigeon shooting to Segway trips and 4×4 rides along the Loch Ness shoreline. It’s likely you’ve already had the odd sample during your stay with us, especially as all our local whisky just happens to be world renowned. But for a more formal lesson in this Scottish delicacy, we can arrange a private whisky tasting here in Aldourie Castle. You may prefer to take a drive to any of the local whisky distilleries, which we would highly recommend, but in addition we can offer an exclusive experience in any of our public rooms at any time of day. Something for the memory book. A traditional Scottish Castle holiday can bring so much joy for you and a house party of close friends and family over Christmas. And you will have realised that in only 12 days you can sample a little bit of everything that the Scottish Highlands is best known for. All this in one grand Castle Estate on the banks of famous Loch Ness. Let one of your New Year’s resolutions be to book your 12 days of Christmas 2018 at Aldourie Castle. And start looking forward to your private use castle stay in Scotland. December 9, 2017 at 2:47 pm. Minus temperature outside? Feeling under the weather? All done in? Or tummy-rumbling hungry? The best cure for any of the above has to be, without a doubt, a bowl of hot soup. Aldourie’s chef loves the castle and grounds during autumn and winter for Scottish castle dining. The colours on the estate change along with the weather and guests’ appetites also change. 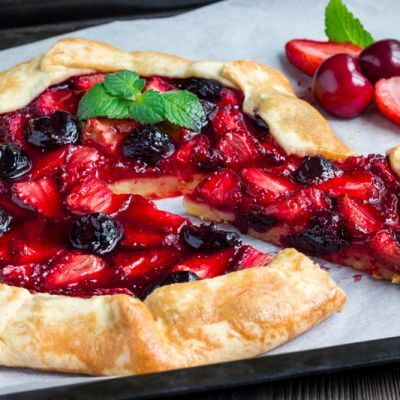 Gone are the desires for fresh salads and cool, refreshing desserts. All they really want – like most of us during the wintry months – are succulent meats coated in delicious sauces, warming soups and comforting puddings – the more custard the better! Our Chef has some delightful recipes he brings out year-after-year as well as, new dishes to impress the gourmet connoisseur. One in particular at the castle we all love for its simplicity, homeliness and heat is the ‘Spiced Butternut Squash Soup’. It’s devoured time and time again by guests and once an exclusive-use party has sampled this particular version, they usually request it numerous times throughout their stay at Aldourie. Here, the castle’s private chef would like to share his favoured, yet simple, autumnal dish with you, so you too can enjoy it at home during the cold, festive months ahead. Chop all the vegetables and sweat in a pan with olive oil. Add the stock and simmer until vegetables are tender. Add splash of cream. 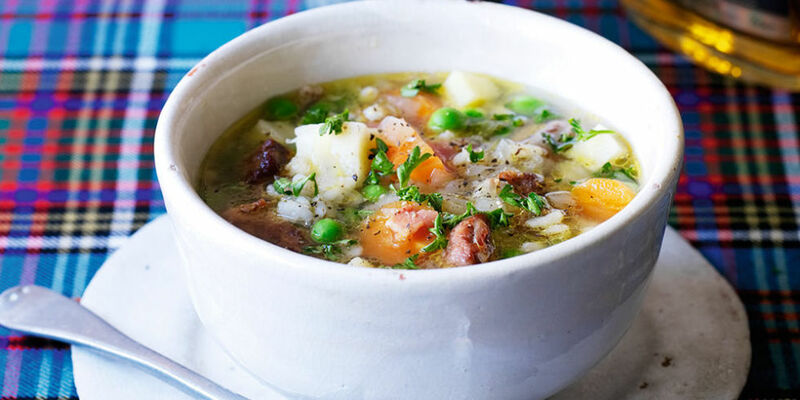 A soup is tastier if it is rich in ingredients and some of these Scottish traditional dishes are also particularly rich in proteins and vitamins. Where is best to enjoy a bowl of soup at Aldourie? Exclusive use house parties of guests dine in numerous rooms in the Castle depending on the time of day. A mid-morning mug of soup might be best enjoyed looking out onto Loch Ness from the cosy yet classical surroundings of the Laird’s Room. This room is also the closest room to the kitchen for quick access to refills! The grand main hall would be great for a soup feast, ladle and all. 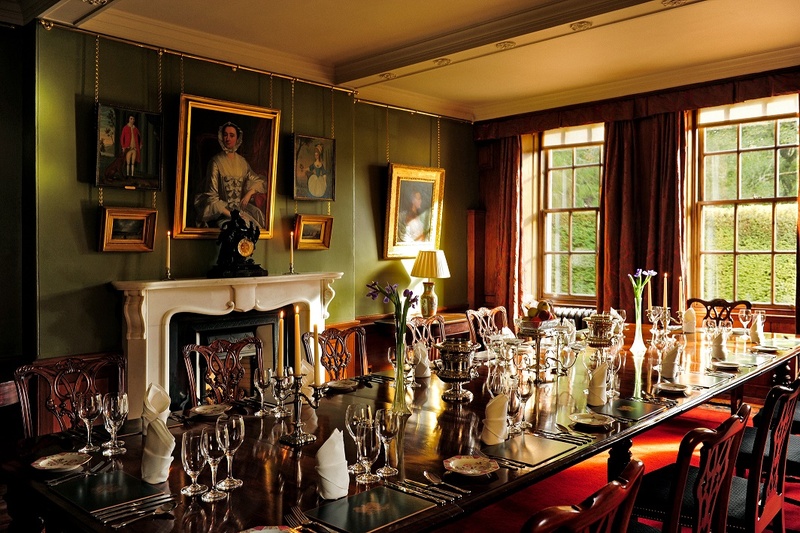 Gather your friends round the large long oak table for a clan-like supper in true Scottish castle dining. The cosy dining room is perfectly designed for eating in, so try here for an intimate candlelit dinner beginning with a soup dish starter. The parkland views will help you relax and conversation will flow for hours as you enjoy four delicious courses cooked by our Highlands castle’s personal chef for that ultimate Scottish castle dining experience. When is the best time for Scottish castle dining? You cannot beat the feeling of a good soup that is both rich in taste and nutritious, trickling down your throat, when you’re either peckish, tired or cold. At Aldourie castle, you could easily be all three of these at the same time if you choose to enjoy one of the many outdoor activities on the Highlands estate during the autumn/winter season. 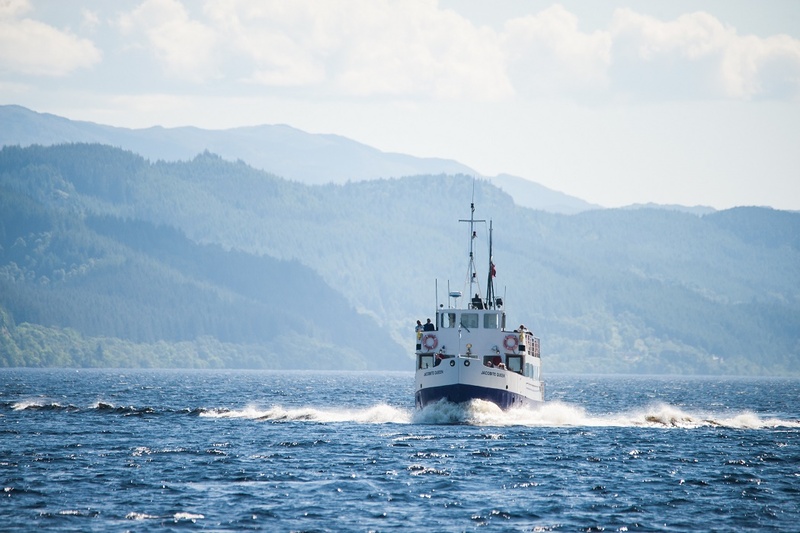 Boat ride – during a stint on Loch Ness hunting for Nessie or simply absorbing the spectacular scenery, private groups of guests are always ready to be fed. Out on the exposed Loch you have the wind rushing in your face and all that water around makes you hungry for soup. 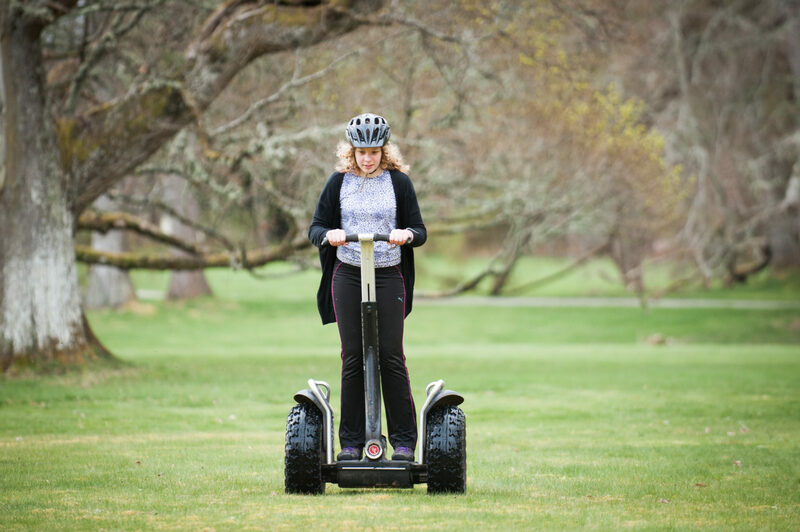 Segway ride – the Aldourie parkland is made up of 500 acres of woods, parks, walks, gardens and more. Segway rides let you see more of the grounds than you would on foot. During the autumn and winter months you use up so much energy and will return to the Scottish castle searching for something warming like a bowl of soup. Archery or clay pigeon shooting – these are popular outdoor activity sports at Aldourie and our chef likes nothing more than rewarding a hard afternoon’s play with one of his delicious soup recipes. Look out for more recipes from Aldourie Castle by signing up to our newsletter through our blog web page. 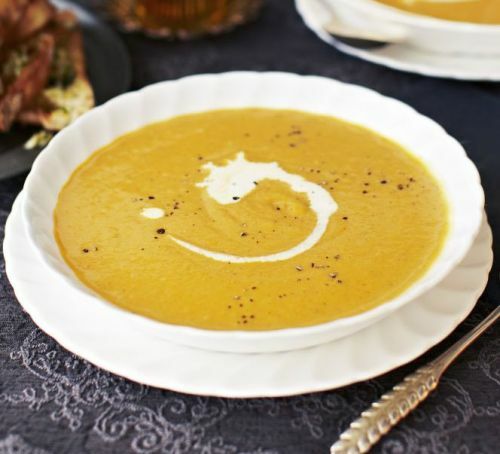 In the meantime, enjoy our ‘Spiced Butternut Squash Soup’ in the comfort of your own home this winter. And…Don’t forget to post us a photo on Facebook or Twitter saying which room you enjoyed eating it in and what outdoor activity inspired you to make it. November 25, 2017 at 8:34 am. Here at the Aldourie Castle estate, we’d like to introduce you to our new Head Gardner – Duncan Hall. Duncan is taking the exclusive use castle gardens and grounds to new heights; literally. So much thought and hard work has been put into the design of the restored Victorian landscape. It now features four considerably different garden areas. Each is enchanting to the eye, featuring various levels, from tall ancient trees to our ankle-grazing kitchen garden. Moreover, each has its own particular purpose. You can read about them in our previous ‘Revitalised Gardens and Grounds’ blog post. But for now, we’re focusing on Duncan and his story. 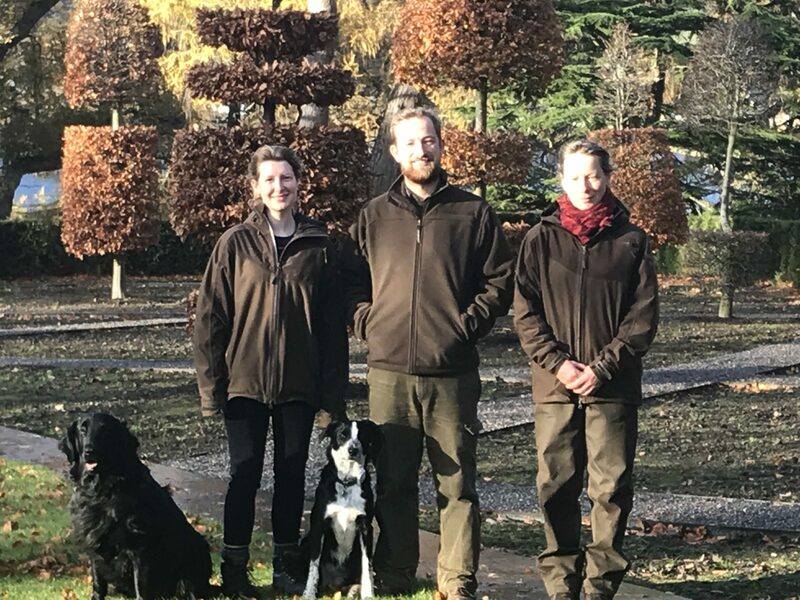 Along with ‘leadership of landscape’ architect Tom Stuart-Smith, Duncan and his team recently improved important parts of Aldourie’s 500-acre grounds. Duncan’s passion for gardening grew as he worked as a landscape gardener where he grew up in Dumfries and Galloway. He felt at home working outdoors surrounded by nature and as a result studied for a “HND in Horticulture with Plantsmanship” at the Royal Botanic Gardens in Edinburgh. It was here that he developed his passion for horticulture and researched the huge range of plants at the RBGE. 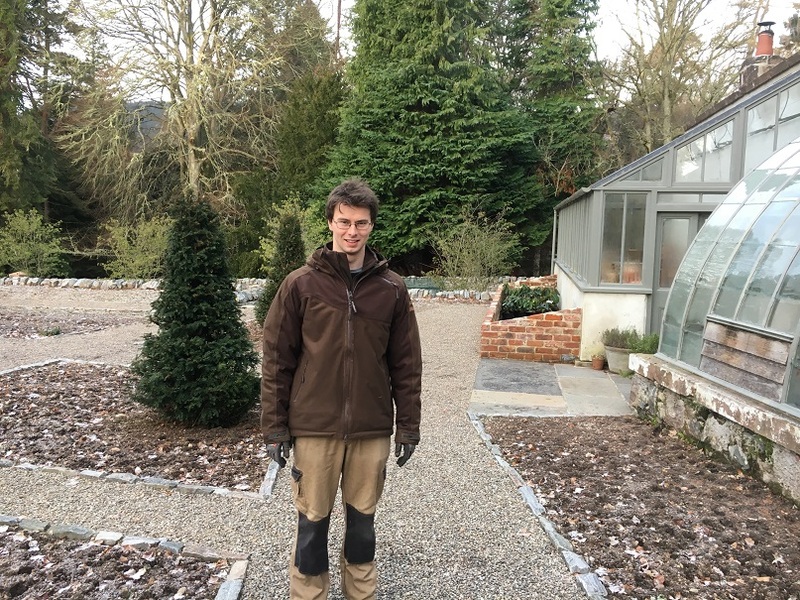 After finishing his HND, Duncan spent a year as a student gardener for the National Trust of Scotland and was based at both Threave Gardens and Branklyn Garden. Threave is a teaching garden for the NTS and Branklyn is a small collectors garden full of interesting woodland and alpine plants. Duncan was then offered the role of Assistant Head Gardener at Cambo Garden, Fife, where he spent three interesting years. 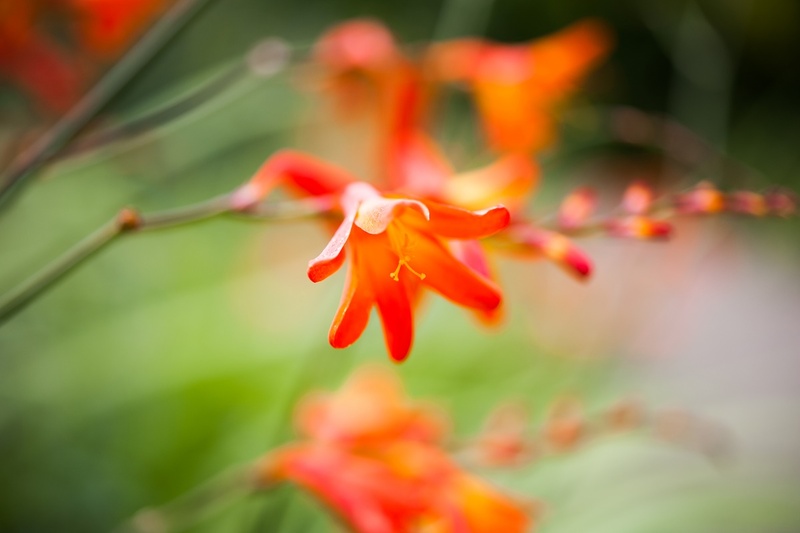 At Cambo he developed a passion for contemporary naturalistic planting and learned a great deal in this area. His guru was the inspirational Head Gardener Elliott Forsyth. Furthermore, he was also involved in teaching students about naturalistic herbaceous planting and design, as well as other general horticultural skills. Duncan says, “it has been very interesting and enjoyable working with Tom and his team. He has learned first-hand about Tom’s style and how he works”. Tom has produced some wonderful planting plans for the castle gardens. The gardening team at Aldourie are now preparing to implement these in spring, something which Duncan is really looking forward to. Look out for our new exclusive use castle gardens and grounds section of the website coming in 2018. This will complement the existing grounds pages. Duncan will also be popping up more frequently in the Aldourie Blog. He will showcase recent project work in the Castle grounds as well as offering handy tips for your own garden and what to plant at different times of the year. For more information on exclusive use stays at Aldourie please contact the Castle’s hospitality team. November 3, 2017 at 3:41 pm. This past year has seen some major renovations on Aldourie both inside and outside. Our last blog post looked at the big updates that have been made to the estate itself. 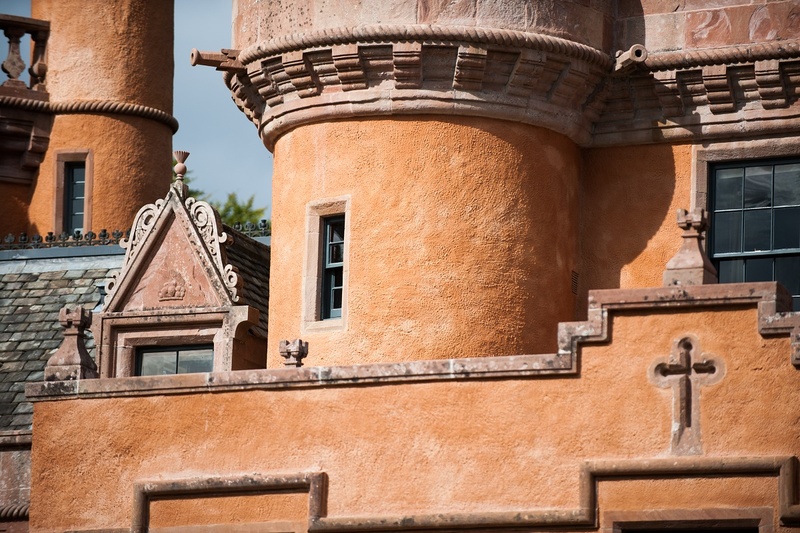 This week we are focussing on the ‘new look’ of the castle exterior. Having undergone a true transformation, the public rooms inside the castle have also had a beautiful make over. These rooms are perfect for all types of luxury occasions; for a relaxing week away with the whole family or stunning weddings or corporate events in an exclusive use castle. We coated the exterior with a limewash harl, giving a whole new look to the exclusive use Castle. In Scottish terms harling describes an exterior building surface technique favoured for historic buildings. Limewash gives a long-lasting weatherproof shield for a stone building and offers a beautiful decorative finish. 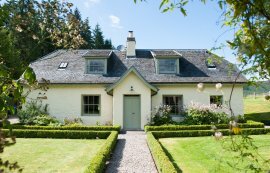 It was the ideal choice for Aldourie, a property that has stood for hundreds of years and has a wealth of heritage to its name. The most exclusive Scottish castle in Scotland is located in the midst of a 500 acre Highlands Estate. Therefore, it needs to be able to battle the forceful Scottish elements whilst still retaining elegance and beauty. The Castle has a duty to continue to ‘wow’ guests as they first spot it along the winding drive. Locations offering good first impressions; a great reason to host your corporate events in an exclusive use castle. The main hall in Aldourie is a large, inviting space that is the central point to the downstairs of the Castle. Its main use is for meeting and greeting and a link between the main Castle doors and the rest of the public rooms. 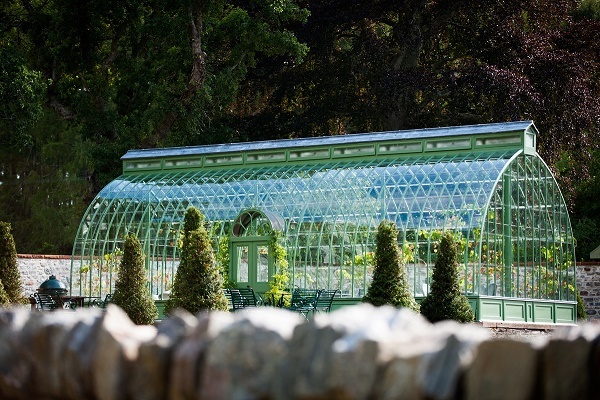 It’s a beautiful, light and airy space integral to the property with large glass doors leading out into the Castle Garden, now a stunning green landscaped area dotted with topiary trees. With a new view that only accentuates the further vista over Loch Ness’ southern shore, the happy room deserved a revamp. The main hall is the ideal space in which to welcome corporate events in an exclusive use castle. The idea for the main hall was for a more natural, Highlands inspired look for a serene, welcoming space that still housed the essence of grandeur. The interior decorating team began by revitalising the walls, replacing the salmon hues with a blue-grey. 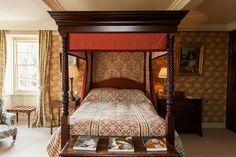 The red tartan over-drapery was removed which fully showcased and lengthened the existing taupe coloured curtains making the windows appear even larger. A huge classical portrait was brought down from the corridor on the second floor and has been given a new perspective for the foreseeable future. We discovered a striking old fireplace with the engravings of the Castle’s family heritage name ‘Frazer-Tyler’ depicted in the stone work underneath the existing, newer fireplace. The present owner and Castle hospitality team are delighted at the find. The fireplace, now larger, is much more of a feature, both historically and aesthetically. A large basket of wood sits just below the mantel ready to top up the blazing fire. 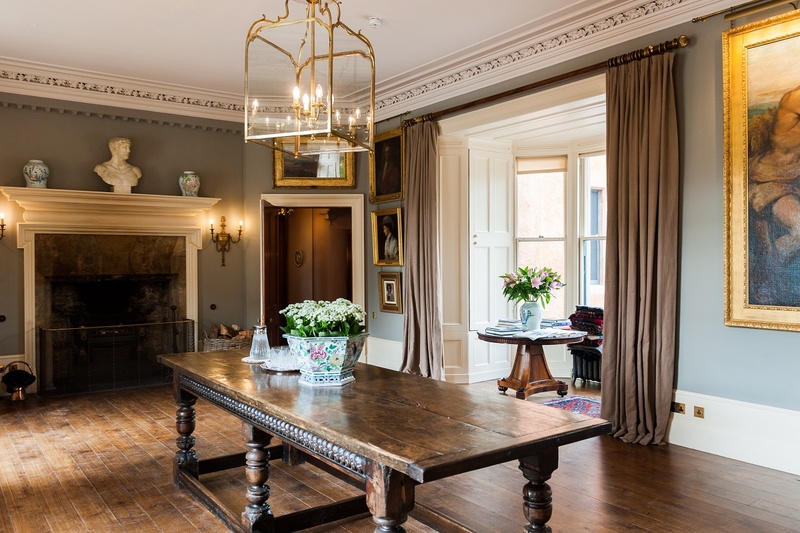 This was a brand new project which included removing the old dark wooden panelling from all the walls and letting taupe painted walls and fine cornice detail in ivory take its place. As a result, a calmer, more elegant looking room emerged, ideal for corporate events in an exclusive use castle. The new table and dozen chairs give the Lairds Room a more classical theme. A stunning theatrical gilded mirror framed by wall chandeliers highlights a Louis XVI-style fireplace below. A huge tapestry hangs opposite and gives added texture to the cosy room. The Lairds room has always been a popular spot for guests, a smaller space than the dining room for entertaining. Since its renovation it has been mainly used as the breakfast room by exclusive use guests. The warm, homely Library has fortunately not lost any of its rich decoration which still give it such depth and charm. The Aldourie Library has always been the go-to place for reading (of course), a game of cards with friends or a dram of whisky in the evening. With this in mind the large room is closed in slightly to make more of the existing space. Seated furniture now faces inwards over a low coffee table and as a result encourages gentle conversation and relaxation. The green settee is now one of powder blue which varies the colour theme in the room and add warmth. The large space now has more clearly defined areas including the writing desk facing the bookshelves for privacy. Originally the Red Drawing Room, this versatile open space now features less of the red and gold it was so famed for. 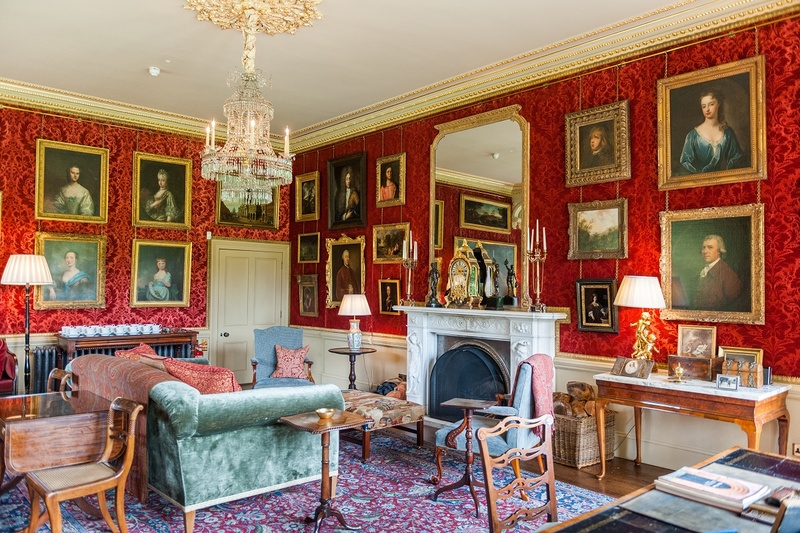 By taking away some of the red fabric furniture, the ruby rich velvet walls framed by a gilded corniche are now a feature of its own. Now sit armchairs in greens and blues, lighter wooden furnishings and tall elegant candelabras atop the mantelpiece. A new large glistening chandelier also hangs over the central area. The result is a more open, airy space that still retains an informal grace. Exclusive use guests have always known the Drawing Room to be the hub of the Castle. They love its ability to be both cosy and opulent as well as its breath-taking views. 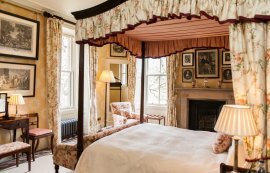 These subtle layout changes have revitalised this much-loved room and added to the title of Aldourie as “the” most exclusive Scottish castle in Scotland. If you would like to book any of your company corporate events in an exclusive use Castle in Scotland then why not give us a call?  Alternatively, leave a message on our easy to use online form where we will get back to you to discuss your needs.